Some clothing creations of mine I like almost instantly, while some others just have to ‘grow’ on me a bit before I can say I like it on myself. I was so proud of hitting my 50th sewing project mark with this little blouse, but the 60’s inspired top itself took some getting used to. Baby doll styles have never really appealed to me. However, I don’t like to be stuck in a style rut and I am willing to try new things. My version of a 60’s Baby doll blouse has finally won me over, and I have a few great ways of accessorizing and matching it. The thrifty part of me also makes me want to brag about how this blouse is made entirely from scraps and remnants… so the total cost is so cheap but inventive! PATTERN: Simplicity 1693, view D. I have made this pattern before, in a different view with modifications, as my ‘Great Gatsby 20’s satin tunic. 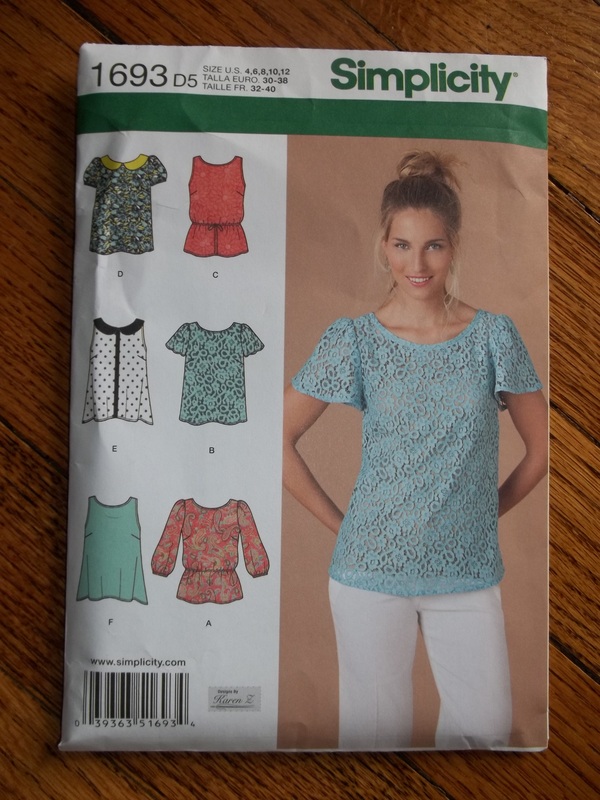 TOTAL COST: the fabric remnant was 1/2 price, and the Fat Quarter was only 99 cents, so my total cost for this blouse is only $4.32. This top has Wal-Mart prices with high-end quality. 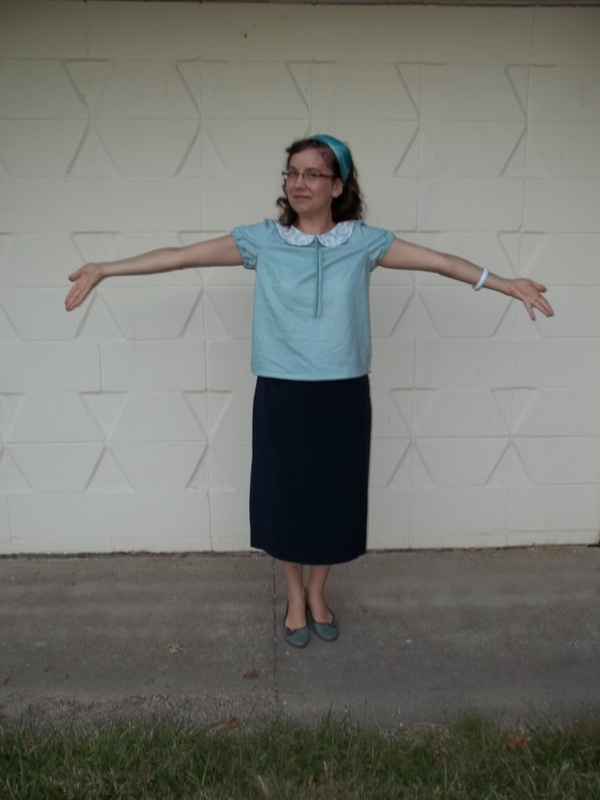 Even though my Baby doll blouse is a different view than the last time I made this pattern (which was for my 20’s satin tunic), I still did the same minor adjustments and came up with the same wonderful fit. I made two sizes smaller for the bust darts and cut a bit generously around the back bodice shoulder area, but otherwise I made my correct size (with grading, of course). I will certainly make more of this pattern, with another different variation, it’s such a great go-to standby, easy to change, easy to wear, and quick to put together. I did find out that .89 yards was too much of a tight squeeze to ever try again, especially with sleeves, but, as always, I made it work. Do not try this at home! As you can see in the picture at left, the little bit of fabric left above where the tunic was cut, went towards fudging in the sleeve pattern. Our dachshund is the black thing in the corner…he’s always on the lookout for interesting smells! My short sleeves would’ve appeared funny any shorter than they already were, so I wanted to add an elastic placket. Merely using the hem for elastic casing does not appeal to my sewing tastes too often, and I also added a casing for the elastic cuffs of my tie-neck knit dress. Then, I happened to find some aqua double fold bias tape in my stash of “Wright’s” brand trims. It matched the aqua background of my fabric, and I had just enough leftover from the two projects it went towards already, my re-fashioned vintage apron and it’s matching mini apron. After using the leftover aqua bias tape towards the sleeve elastic casings, I still had a small strip. I hated to not find a way to use up all of the bias tape. When I tried on my blouse, it was still missing that “something”, so the small leftover strip was cut in half widthwise and sewn up into ties for the front. I am so proud at how perfectly I matched up the front designs of the collars on my blouse. 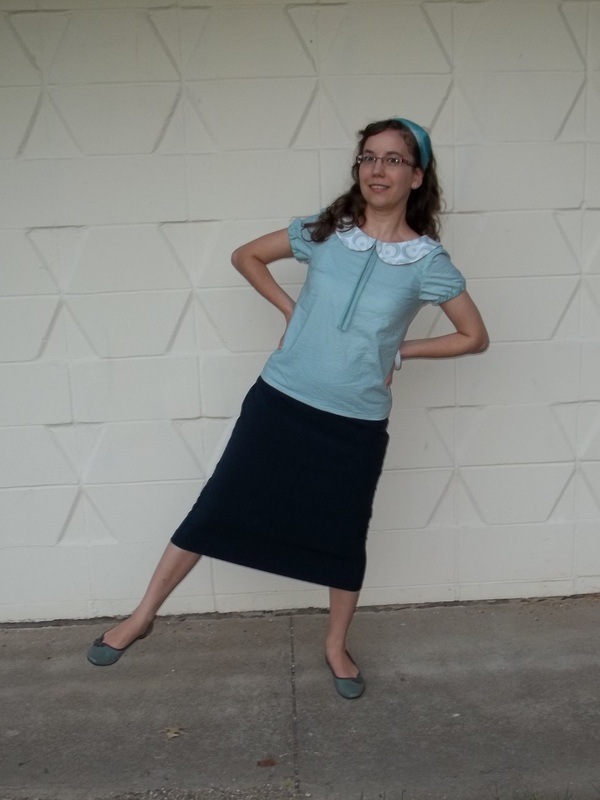 The fat quarter was more of a stiffer cotton than the cotton for the body of my top, but therefore perfect for its use. I love how the design on the fabric of my collar is a wild match which makes my top much more fun and retro than if I had chosen a single color. A simple button placket went into the back button closure of this Baby doll blouse. 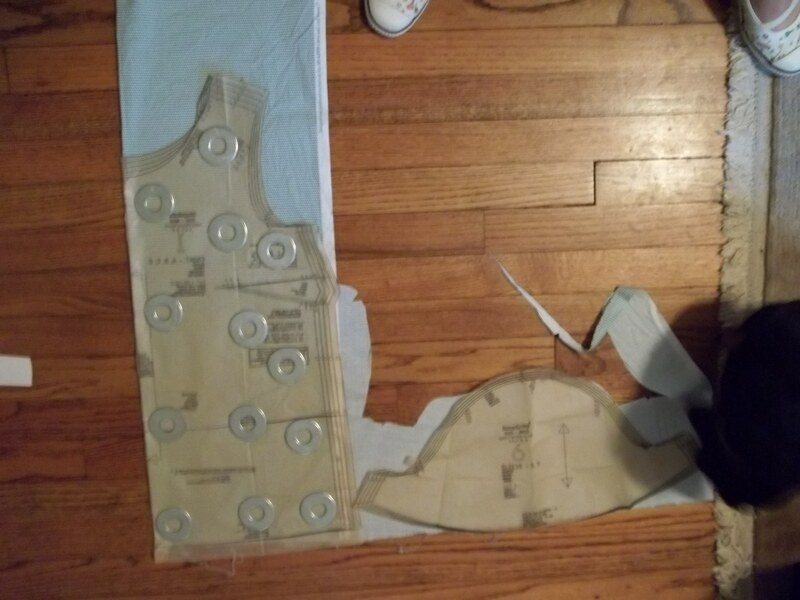 Since I had cut both the front and the back bodice pieces on the fold, I put in a vintage style placket, the kind where you cut out a rectangle, hem three edges, sew it down around the slash marks, then turn right sides out and top stitch down. I did this same method for my 1937 Peacock blouse (see my post for a visual explanation). The aqua button is from my vintage stash, and the loop is a tiny cut of 3/16 inch ‘president braid’ used to make my “The Artist” Movie imitation dress. Please excuse the wrinkles…wearing 100% cotton is great but a short trip in the car can make its mark on it too soon. That’s all folks! 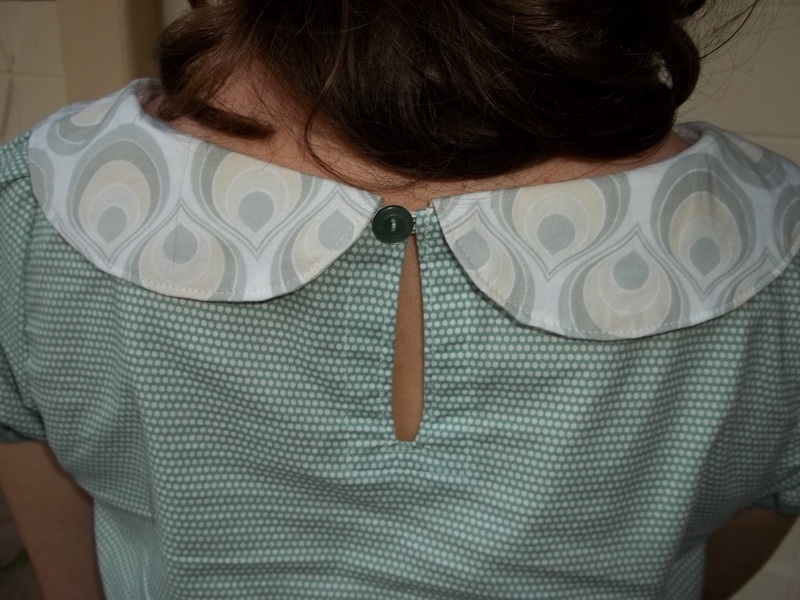 See my Flickr page (link here) if you would like to see more pictures of my 60’s style blouse. This entry was posted in 1960's and tagged "polka dot", "Simplicity pattern", 1960's, aqua, Baby-doll style, blouse, collar, cotton, retro, Simplicity 1693, top by kellycb. Bookmark the permalink.